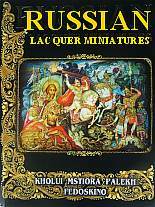 Russian Lacquer Miniatures: Kholui, Mstiora, Palekh, Fedoskino. This book begins with a brief history of Russian lacquer boxes and information on how they are created, and features a brief overview of the style and evolution of lacquer art in each of the four villages, but also lets the art speak for itself with a dazzling selection of color photographs of exquisite works from top artists from the 1800s to modern times. The text is in English, and each box is labeled with the title, artist's name, and date of completion. 159 Pages. Slight shelf wear from storage.